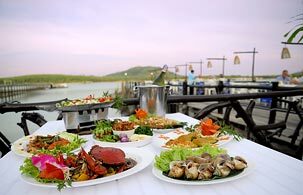 Laemhin Seafood is located along Phuket's east coast, just opposite to Maprao Island offering spectacular waterfront views of Laemhin Pier and famous seafood selections. The restaurant is renowned among Phuket locals and tourists for its live seafood cooked by master chefs, using the freshest and best quality ingredients caught from Andaman Sea.. Here is completely one of the MUST restaurants to visit in Phuket. Laemhin Seafood is a typical kitchen that presents an array of genuine Thai dishes to tickle your taste buds. It's a perfect restaurant to hold the special celebration; birthday party, holidays, social gatherings, family gatherings and etc. We can serve up to 300 person for maximum. Have it fresh. Taste it real! !